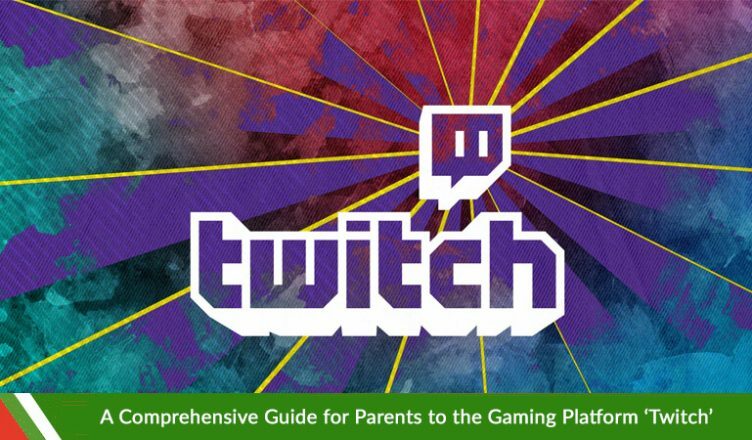 Twitch is one of the newest platforms that has taken over the gaming community by storm. If you or your children are associated with gaming or the Internet at all, you might have heard of it! It is an online video service and has become the world’s most popular live broadcasting platforms for things like personal streams to video-game streams to major videogame tournaments. Twitch is a great platform to discover new game titles and new and upcoming contenders in the gaming tournaments. However as with any major online platform, there are still some precautions one has to bear in mind to ensure your child is using it safely. Twitch is a platform where you can watch other people’s live streams, of them playing video-games, talking or just hanging out. Twitch can be accessed through desktop, iOS or Android apps and even gaming consoles such as the Xbox One or Playstation 4. Anyone can stream on twitch, which means that your kid might have had a go at streaming themselves playing a videogame. The service has over 100 million monthly viewers with more than 1 million broadcasters who have twitch streaming into a viable source of income. Who Are My Kids Watching on Twitch? Twitch is house to many users who have gained popularity over the years and have become the site’s top streamers. Many people who go on Twitch watch streamers for their personalities much like YouTube but Twitch is a more direct way to connect with your favorite personality. The Twitch community interacts with the streamer through the Twitch chat, which is a live feed of comments. With streamers who have millions of subscribers, the chat might as well be pointless since the chat stream is going by so fast. But streamers with not so many subscribers the twitch chat is a huge part of the community for that particular streamers. Twitch isn’t all video games though. Even though the video games category might be the most popular, other categories in the dedicated Creative hub exists where you can watch people paint, play music, cook or even catch up on Bob Ross’ The Joy of Painting. Twitch has another category known as the ‘irl’ or in real life section where streamers will stream their lives, they don’t have a particular ‘act’ so to speak, it’s just them doing normal everyday things. Sounds boring but one of the most popular twitch streamers are ‘IRL’ streamers. How Kid Friendly is Twitch? Twitch doesn’t really have a family filter so there isn’t a real way to filter out popular streamers however most of the popular streamers make an effort to keep it family friendly as they are aware of their audience demographic and will refrain from obscene language or acts. That doesn’t really mean that they won’t ever, they might slip up here and there because it is a live broadcast but most mainstream streamers try to keep it family friendly. If your kid is into Minecraft or Fortnite and watches a lot of content related to it, streamers will most definitely be kid friendly. Their favorite content creators from YouTube might be on Twitch too so there is a crossover. Does it cost anything to use Twitch? An essential part of Twitch and its community is donating to streamers. Whether it be a dollar or a hundred dollars, viewers are able to donate to their favorite streamer. It is absolutely up to the viewer to donate. You might have to consider keeping an eye on your kid who impulse might donate to someone. You can watch any streamer you like for free however you subscriber to individual channels for $5 each. The benefits of subscribing to a channel is determined by the channel itself, it is usually exclusive emoticons and being included in subscriber only giveaways or to be a part of the live stream itself. Other than that, users can purchase Twitch Turbo, an $8.99 monthly subscription which gets you ad free videos, exclusive emoticons, a Turbo badge next to your username in the chat and extra video storage for streamers. How Does A Normal Stream Go? A normal stream will start by, first the streamer announcing on other social media platforms that they’re about to stream, or they will usually follow a schedule. If they have a schedule, that will also determine how long a stream might go, the usual time can range from half an hour to an hour. During the stream, viewers interact with one another and the streamer, and usually it is pretty laid back. It gets pretty exciting when something noteworthy is happening and it’s fun to react to a particular situation together. But one has to first see and get a vibe of the community of that streamer and the chat itself. The chat might expose your child to some foul behavior. There aren’t any universal chat filters for viewers however the people doing the broadcast have the ability to filter words and hyperlinks from their chats. The bigger channels should have absolutely no foul language in their chats. Chats are moderated by moderators chosen by the streamer and it is their responsibility to keep things in order. Other viewers can interact with you personally by using the Whisper feature, which is basically a personal message feature. The streamer can send you a Whisper too and it’s a good way to talk to someone in an actual conversation when the chat is going by fast. Just be vary of malicious content that might be sent through the Whisper feature. And if you want, you can hide the chat altogether. You can easily block out and filter other people and unwanted on Twitch. Simply go to Setting>Security & Privacy. There, you will see an option to block messages, users, Whispers and group chat invites. If there’s just one party pooper in the chat, you have the option to mute them by hovering over their username and selecting the Ignore button. Twitch it a very interactive platform that engages both viewers and streamers thoroughly. It is a great place to consume content but as with any platform, watch out for the content that you might deem offensive by first fishing them out. If you can’t find something you’d like to watch, how about streaming it yourself!